Fort Peb is situated on northeast side of Panvel, on Mumbai-Pune road, at a distance of 3-4 km on west side of Neral. 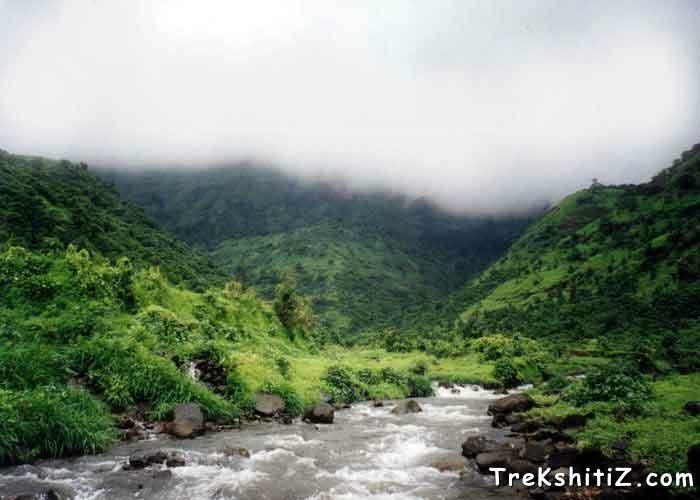 To avoid crowd at hill stations like Matheran, nature lovers must visit the nearby fort Peb. This is the most beautiful one-day trek. One would find Peb similar to Gorakhgad in terms of the time required to climb the fort, ways towards the fort, the cave and the surrounding nature. But there is a dense forest on the way to the fort Peb. Nowadays deforestation has reduced it a lot. The fort is also named as �VikatGad�. It is assumed that this fort derived its name Peb from the �Goddess Pebi� at the base of the fort. Historical references clearly indicate that Shivaji Maharaj used the caves on the fort as silos for grain storage. The cave on the fort is occupied by disciples of Swami Samarth, a great saint. They have contributed a lot to development on this fort from last ten years. They have managed successfully to keep the cave and the fort clean, and maintained the dignity of the fort. Near to this cave are meditation caverns, which are underground. These caverns are still in good condition. One has to crawl into these and only one man can enter at one time. In monsoon two of these are filled with water. On the top we can go by climbing the wall of the fort. This would have been the main entrance. From here we can climb by holding the rods fixed in the rock. The people provide ladder on request. On the top we can see some remnants. The main attraction here is the bastion on the topmost part. This faces the mountain of Matheran. Here we can clearly see the ridge connecting mountains of Matheran and Peb. When we stand here we feel to be at the top of the world. Here we find many crystals. On the other side of the fort is a temple of a deity. Here is a big cistern. The disciples are constructing a good temple here. We can reside here for some time. The beautiful waterfall on the way is the main attraction here. Surrounding scenery looks marvelous from the cave in the monsoon. From here we also see the pinnacles of Navara-Navari, Bhatoba and Irshaal, along with forts of Chanderi, Prabalgad and Malanggad and also Nakhind. This trekking is pleasant in all seasons. Alight at Neral station on the central railway route and take right. The way on the left takes us to Matheran. A ground, a poultry farm and some houses under construction could be remembered as landmarks on the way. Then proceed towards the huge electric towers on the way. After we arrive at a tower with a big cement base, we see a big waterfall. There are three ways near this waterfall. The way along the waterfall goes through forests and it�s not possible to proceed along this way. Whereas the way along the towers is very very lengthy and there is a diversion on this route, which go towards Panvel. One might get lost on this way. So the best way is the central one, which takes us to the cave on the fort. On this way we see a rock with carving of Lord Ganesh. Ascend from the right side of this rock. Though this is the way of a small waterfall, proceed along the same way. This way takes us at the ridge. From the ridge turn at left and go further. Here we see a big white rock. Climbing this small patch and walking for 10 minutes we reach at a cave. It is advisable to go with a guide. 2 to 2� hours are required to climb the fort. Another way to Peb is from Panorama point at Matheran. From here we reach at the cave within 6 hours. Carving of eagle is seen at the base of cave. As the disciples of Swami Samartha stay in the cave, we can stay in the cavern nearby. About 10 people can be accommodated here.